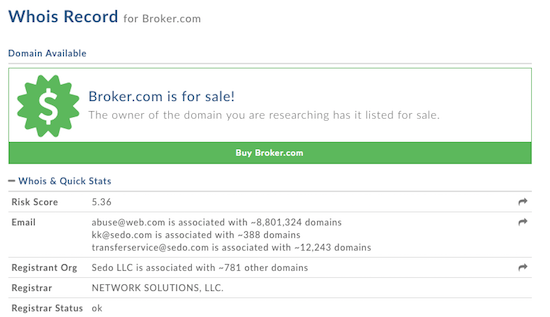 According to a tweet this morning from Sedo broker Dave Evanson, the domain name was brokered by him for $375,000. The buyer of the domain name is unknown since the domain name is in an escrow account and the landing page forwards to a broker service page within Sedo’s website. I looked through my email records, and it looks like Dave began brokering this domain name in March of this year. He mentioned Broker.com in a few emails, but I do not see an asking price for the domain name. NameBio does not show any previous public sales of Broker.com, and it looks like the seller had the name for a while. Broker.com will most likely be one of the highest selling domain names of the week when it is reported to DNJournal. A few days ago, Andrew Allemann reported that Dave Evanson brokered the $650,000 sale of Furniture.co.uk, which will likely be added to the DNJ sale report this week. These two sales are the largest publicly reported sales of the year for Sedo. It also looks like Broker.com will rank as one of the top 10 public public sales of the year when it is reported. It will be interesting to see how this domain name will be used since there are so many types of brokers (stock broker, pawn broker, real estate broker, yacht broker, insurance broker…etc). Once the Whois updates to reflect the new owner’s information, we may get an idea of how this domain name will be used. What a steal. Congrats to the buyer. From that sale, any thoughts to what kind of a value then a two word phrase such as officebroker.com or warehousebroker.com might be?